Okay, so I don’t know if it’s just my own action-packed week thus far, but I just can’t let myself get all doom and gloom about the match today. Did we need a win today at home to ensure our place in the finals? Desperately. Did we need a clean sheet going to the Stadio Renzo Barbera? Absolutely. Am I going to cry because we didn’t get these things? No. This one wasn’t worth crying over. Considering that just a month ago we went to Sicily and were lucky to escape with a 1-0 loss against Sersi Cosmi’s Pink Death, I can accept today’s draw. So I thought instead of crying, I would outline for you the good, the bad, and the ugly of this Coppa Italia Semifinal 1st leg. Ibra scoring in the 4th minute. In fact, despite what other people may be saying, I thought he had a pretty good game today. I liked that in the 8th minute, when he was going for the bicycle kick, he sacrificed the potential goal so as to avoid the potential red card and possible boot-induced facelift of a Palermo player. Oddo’s miracle cross. I swear, I think my loathing of that man has made him a better player. That cross was perfection, a thing of beauty. I think I fell off the couch when I realized it came from Oddo. (Does this mean I should keep loathing him?) Well done, sir. The fans. That was a lot of people for a mid-week Coppa Italia match, even if it was a semi-final. I get the sense that Milan fans want to be a part of what just may be around the corner, and even if it would be nice for them to have rallied around our team all year long, at least they’re showing up before the party. Now is when our players need that extra boost the most. And boost they did, the noise was music to my ears. Pirlo’s first start since injury. I think some people were disappointed, I don’t know what you would expect, but I LOVED Pirlo's passes and set pieces. They were just what we've been missing. I would be curious to find out what his pass completion rate was today. I know he had 100% pass completion in his less than 20 minutes vs. Sampdoria on Saturday, I think it must have been pretty impressive today for all 90 minutes. Milan played like Milan. Whereas last month Palermo blindfolded us and spun us around until we puked, today, we played our game. We had 59% possession, which is how we like to roll, and we never gave up, even if we gave up too many chances. Bravo. 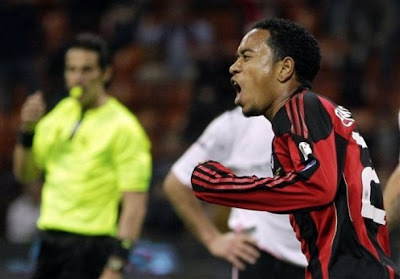 Urby’s goal and celebration. Wow, we gotta get that boy off of the bench more often. Sirigu might have lost a limb trying to stop that bullet. And very sweet to see the new 2nd-time papa with the baby celebration. Congratulations and thank you! Good hair. Loved Gattuso’s best Yepes impersonation, and seriously, I still cannot thank Pastore enough for cutting off that damned mullet thing and joining the rest of us in the year 2011 with a great haircut. Now if only the haircut would have had the Samson effect in regards to his goalscoring prowess…. The Lineup. I’m not going to yell at Allegri, I understand what he was trying to do here. I also understand that as much as we want the double, the Scudetto is more important. But playing 7 people off of the bench? Players who maybe have never played 90 minutes together? That might have been a bit conservative, even for Allegri. Finishing. Bored of talking about this, it wasn’t atrocious today, but it wasn’t great. And as much as I loved Oddo for his assist on Ibra’s goal, the man should be forbidden from shooting. There’s a reason that you’re open, sir. And to think he almost made a fan out of me. To be fair, though, this is one of those things that is easy to point out in hindsight and having watched match highlights - should’ve passed instead of taking the shot, vice versa, etc. Ibra’s jersey alteration. Who says Italian football is physical? That gaping tear that run the length of Ibra’s jersey, that’s who. (I’m talking to you, Mr. De Marco!!) If you ever doubt that those boys are getting roughed up, know that those jerseys are manufactured to withstand a LOT of pulling, so that tear didn’t come from casual contact. The ghost PK and other ref calls. Alright, I’m not a conspiracy theorist here. The ref did a great job overall. All I’m saying is when a player much smaller is standing right next to Ibra when he falls like that, it’s unlikely that he was giving Ibra a pat on the back. But having been the recipient of some generous calls this year, too, I’m not going to complain about this one. Or any others in this match, for that matter. Seedorf’s entitled attitude. The Dutch senator has been winning haters over lately with his renewed performances. Today was not one of them. And when Urby was subbed on for him in the 56th minute, that entitled attitude and headshake made me want to ship him off to Brazil. He is a class act, but too entitled to accept a substitution, a start on the bench, or to even sit one game. It’s a shame. Sokratis Papastathopoulos. I would like to credit him with the assist on both Palermo goals, but that would imply that he had actually kept up with the ball or at least his man. /EPIC FAIL. If Legrottaglie was not sitting on the bench, I would understand. But I do not understand this one. Hope we've learned our lesson!! So now we’ve dug ourselves into a hole of overcoming Palermo's away goals as we travel into hostile territory in May. Even though the score seems level, it’s not. But I do think we can still do it. Delio Rossi’s Palermo is not as much of a curse as Cosmi’s was for us. Let’s just hope he doesn’t take a page out of Cosmi’s gameplan and I think we can get to the finals. Forza Milan! This post was brought to you by the fine musical inspiration of Muse’s “Absolution” album. The title run-in: where are we now?